Tanya can see fairies, and would love to meet someone else can see them too. When she meets Ratty and his cheeky fairy, Turpin, it seems at last she’s found them. But Ratty has a secret, and a dangerous enemy who’ll stop at nothing to get to him. Michelle Harrison’s Thirteen Treasures Series is a favourite of mine. I’ve raved about it before, I love its horrendously vicious fairies, the blend of adventure and mystery and its characters, specially the girls Tanya and Red. I was very happy to hear that the author was going to write a prequel – this here One Wish – featuring Tanya. In it, Tanya is spending the holidays with her recently divorced mother in the small town of Spinney Wicket. Tanya can see fairies and has been the victim of their terrible pranks but no one has ever believed her. Keeping silent seems like the best way to go until she meets a young boy named Ratty and his fairy friend Turpin. In an afternoon spent together, Tanya learns from Ratty that not only other people see fairies too but that there are steps she can take to protect herself from them. But her happiness and relief upon learning she is not the only one who can see fairies is short-lived. The day after meeting Ratty, Tanya wakes up with barely a whispered memory about Ratty and Turpin. Recovering her memory happens by accident when Tanya learns that Ratty is keeping a secret that threatens the whole world. Just then Ratty is kidnapped and Tanya needs to do everything she can to save her new friend. 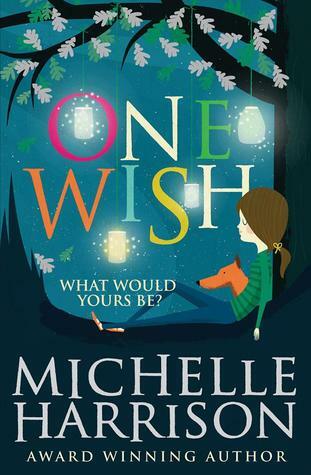 On its own, One Wish is a solid book, with the same type of story one can expect from the author of the Thirteen Treasures trilogy. This means that the book features a lovely pair of protagonists who go on adventures, who have to make difficult decisions and in the process, start to grow up. There is also a sharp, thoughtful undercurrent in its plot that examines the power of memory, imagination and friendship. As an aside, it amazes me how the blurb, the title of the novel and the marketing behind the novel so pointedly focus on the wishing tree and the one wish it grants, when this is but a minor, peripheral part of the story (and eventually even works as deus ex machina). I will admit to being disappointed about this as the potential for an incredible story about wishes and choices was huge but unfortunately this part of the story was underused. With all that said, even as I appreciate One Wish as it is and on its own, personally speaking, it was impossible for me to distance myself and separate One Wish from the trilogy that both follows and precedes it. We are about to go into spoiler territory, so please avert your eyes from the next paragraph if you don’t wish to be spoiled. The main reason for this difficulty comes from the very basis of this book. Because you see, Tanya’s character arc and growth in this book is very, very similar to Tanya’s arc and growth in The Thirteen Treasures. In both books Tanya undergoes exactly the same journey: starting from her experiences as a lonely child who can see fairies and is tortured by them to learning the truth about them, about how to protect herself and how a friendship with someone who understands changes everything. How can the same arc be experienced twice, you might ask? Well, because there is a huge cop-out at the end of One Wish: Tanya is made to forget everything she learns about fairies in the book, effectively making the entire story pointless in preparation for the what can now only be described as a “reboot” in The Thirteen Treasures. I can’t help but to feel that One Wish would have made more sense had it been a story from Ratty’s perspective rather than Tanya’s. In the end, whilst I can’t deny the quality of this book or its appeal, I also cannot separate it from the trilogy it is now a part of. I wish I felt differently. Additional Thoughts: We are part of the blog tour! Michelle Harrison wrote a lovely poem about the setting of the novel and you can read it HERE. Rating: 6 – Good, recommended with reservations to those who have read the original trilogy.